Guinea pigs, just like other animals, enjoy fun and stimulation. From running around and simply exploring their environment to burrowing and playing with toys, guinea pigs can find fun and enjoyment in many activities. Make activities available to your furry friends to provide them with a happy, high quality of life. Burrowing comes naturally to guinea pigs. In the wild, guinea pigs will burrow and build comfortable nests to protect themselves and their young from predators. You can allow your buddy to create his own burrowing spots within his cage by providing a cage that's big enough to burrow in. The Human Society of the United States points out that many people don't buy cages that are big enough to comfortably house their guinea pigs. A single guinea pig requires a cage that is 7.5 square feet. More room will be necessary for each added guinea pig. Providing wood shavings is enough to allow your guinea pig to burrow. In keeping with their natural desire to burrow, tunnels provide endless fun for guinea pigs. They can crawl through the tunnels and may even decide to indulge in a nice nap right in the middle of the tunnel. Guinea pigs may play "chase" with one another in and out of the tunnel. Provide a cage that is large enough for your guinea pigs to run around in their tunnel together. Putting the tunnel on the floor in an area where your guinea pigs have more space to run around in can be more enjoyable for them. It will also help them to get their much-needed exercise, as sedentary guinea pigs are at risk for cardiovascular disease. You can purchase tunnels fit for guinea pigs at pet supply stores, or make them inexpensively at home using cardboard tubes. Make sure they are big enough for your guinea pig to fit through. Light bulb boxes can also work. Tape them together and add more boxes to make the tunnel larger. Place newspaper on the "floor" of the tunnel to help it last longer. Guinea pigs love to play with one another and will be more playful in a cage where they have adequate space. An old sock or a simple piece of newspaper may result in two guinea pigs engaging in a fun game of tug-of-war. They may also use the sock as a pillow or drag it around their happy little home. Many animal companions may enjoy batting around a ball from time to time and guinea pigs are no exception. 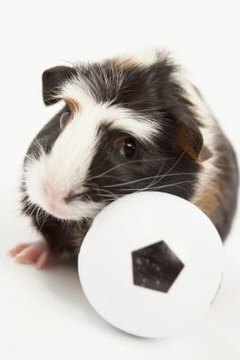 A ping pong ball or cat-sized ball can provide entertainment for guinea pigs. Tennis balls may also work, but they may not be as fun as lighter, smaller balls that are easier for them to push around. A wadded up piece of newspaper may also be a hit, as they enjoy the crinkly sound it provides.